We welcome advertisers who share our interest in using the web as a means of reaching the fans of Australian football. Some background and guidelines follow to help you learn about the benefits of advertising on our website and in our newsletters. 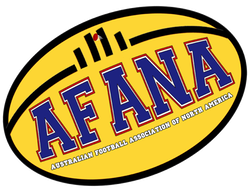 If you can't find the information you need or you have questions, don't hesitate to send an e-mail to: aussiefb[at)afana[ dot }com . Our web site reaches the broadest international audience of Australian football fans on the web. Fans visit our site for the latest news about the sport (from both North America and Australia) and for the latest TV schedules. This web site is consistently among the top 4 most popular footy sites on the web. We can generate traffic to your site and the products you offer with a strategically placed advertisement on this site. This web site is continuously updated and fans know that the most current information on the sport of Australian Rules football can be found here. We have the latest TV schedules -- more up to date than the listings in local newspapers and cable and satellite TV guides. This is because the deadlines for those publications are as much as six weeks before air time - and six weeks in the TV business is years in other advertising media. Fans depend on AFANA. No other web site provides the services to the fan found here. Using the Internet allows us to provide the most accurate and complete information on Australian football TV coverage anywhere. Reach the most highly motivated members of that audience right here. We are the trusted source if you want to know about the AFL in the USA and Canada. We believe in the Internet as the cutting edge means of reaching potential members and customers. In the past year alone, this site has had more than 1,000,000 unique visitors and served up over 20,000,000 web pages to visitors. Annual traffic growth is over 33%. Web page banners may be in GIF, PNG, or JPEG format, and may be animated with a maximum file size of 16k. We will happily resize or convert your graphics upon request and ordinarily at no additional charge. We recommend that you keep the size at not more thjan 175 pixels wide. We accept square advertisements for side panel placement but space is limited. Payment is required prior to display of the banner. We can accept payment by check, money order, PayPal (preferred) or wire transfer but not credit card. Advertisements may contain either or both graphics and text. We accept banner advertisements on a very limited basis and they appear in rotation on all pages at this site. We reserve the right to modify or reject any advertisement not meeting our standards. Advertising from sites that promote or engage in political, gambling, *gambling term*, or sexually related activity are not accepted. +1-614-571-8986 to speak with Rob and get your advertisement on this site today!